Another photo I made with My Corina plastic camera, this one is from India. Remember to check out My Gear list. I was quiet amazed to see that they are still using this old school monitor in O’Hare International Airport in Chicago. Retro and I like it. Made in O’Hare International Airport in Chicago, when I was waiting for My plane home. 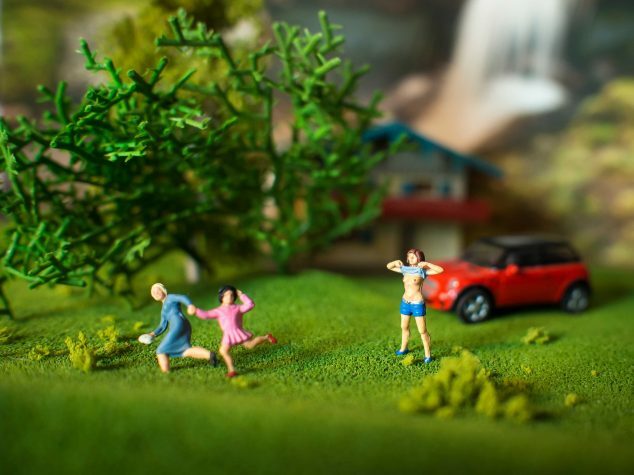 Another one from my miniature photo fun day. I don’t really know what this place is, I think people are getting married in here, but I don’t think it’s a church. Do you know? I got up early one morning in Battambang, and spend a few hours at this rather huge road, making photos of the people going to work. Another one from the Festival of Colors in Spanish Fork, Utah. Post no. 900 on the blog…. Here’s a photo from the Festival of Colors in Spanish Fork, Utah, that I attended this weekend. It sure was a whole lot of fun. More to come later. Don’t play to many trick on people today.